Sandy Tolan with Dr. Mohamad Abu Samia, director of the Rantisi hospital in Gaza. Photo by Abdel Kareem Hana. This morning in Gaza, a whiff of war in the air in the wake of Israel’s deadly overnight air strikes – a shaking of the fragile ceasefire a few days earlier. All week long I’ve been looking into the human consequences of Gaza’s water crisis on the ground here, visiting refugee camps, talking to hydrologists, engineers, officials, UNICEF and other international donors, and chatting with people along the harbor and the beach. This morning, as I spoke with a Hamas water minister, the wail of an ambulance and a slow mournful dirge began drifting through the window: a memorial procession for the three men killed last night. Surreal and disturbing as it was, the true human stakes of the water disaster here came into focus only when I started talking to pediatricians. One, from the health ministry, told me that he’s seen dramatic rises in kidney failure, typhoid fever, hepatitis A, salmonella and severe diarrhea in the children of Gaza – between a 30 and 50 percent rise, he estimated, just over the last few months. Much of this he attributed to water and food contamination, the result of salty well water, water delivery trucks carrying e coli, and food that spoils with only four hours a day of electricity – part of the economic strangulation of Gaza. In the evening, we met with another pediatrician – Mohamad Abu Samia, director of the Rantisi hospital in Gaza. 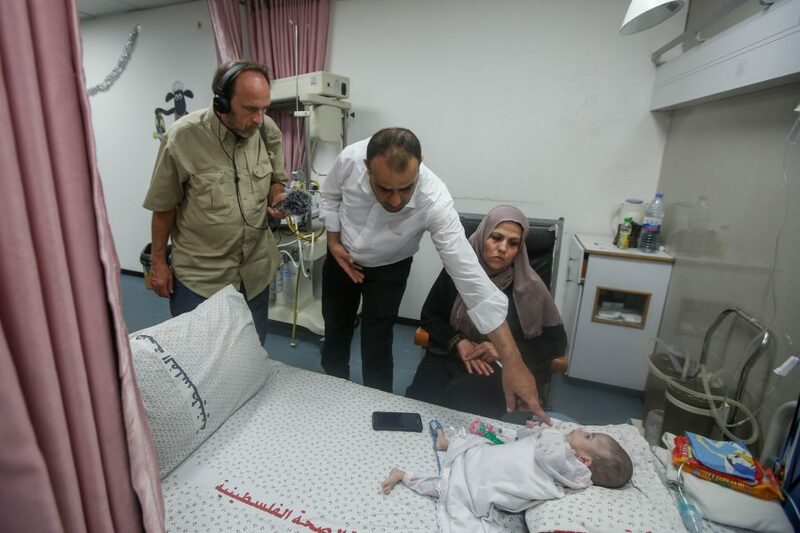 He told us he’s seen a doubling cases of gastroenteritis, renal failure, and thyroid cancer, and the rise in a previously rare disease: Blue Baby Syndrome, related to the elevated nitrate levels in the Gaza wells. “Bluish lips, bluish face, bluish skin,” the doctor tells me. And blood the color of chocolate. Then the doctor led us out of the small examination room and into a quiet ward with some of the sickest babies in Gaza. The room was sectioned by curtains, and he had a few kind words to dazed mothers trying to comfort babies with congenital heart disease, severe malnutrition. The mothers have already lived through three wars and an economic siege. Doctor Abu Samia softly exchanged words with each mom; in one case, he gently lifted the shirt of a tiny infant, revealing a scar from heart surgery nearly half the length of her body. Another was hooked up to a respirator – the minute it stopped, the child would die. And because electricity runs only four hours a day in Gaza, the baby must stay at the hospital, where generators keep her alive.